View topic - Replication sega my cards - Forums - SMS Power! Does anyone know if the sega my card has been replicated in flash, or if there is even any interest in replicated cards? I read about the my card EP but im going to guess they are fairly rare. Im going to have a crack at building a couple as part of some experimental stuff at work. I wondered if a boot loader would be good on card rather than doing a bios replacement mod as the card slot is checked first so it could always be left plugged in. That said, it would be no good for a master system 2. That said, I'd be very interested in having new Sega Cards made, and your boot loader idea is definitely an interesting one. They also would be perfect for smaller homebrew projects. Its a little limited on space (32kbyte) due to the reduced addressing pins on the interface but it could still be useful for something. As far as im aware with a card catcher or power base converter they can be used on all 8 bit sega consoles and also the magedrive/genesis. That said... im not sure if there was a card catcher for the sms2.. so that may still be out of the picture without additional adapters. Was there an export card adaptor? I'm fairly sure the official one was only Japanese SG-1000 era. I'm fairly sure the official one was only Japanese SG-1000 era. That would make sense as the export master system had a card slot built in so there was probably no need for a card catcher to suit it. By the time the master system 2 came out the card based games were probably well out of production anyway so i guess it probably didn't really matter. Interesting that they felt it useful to put a card slot on the power base converter for the genesis/megadrive though. I guess that still kept compatibility for the 3d glasses adapter though. Some card games also work on a cartridge. I programmed a chip with Transbot, put it on my test cartridge board and it worked fine. I haven't tried other games. All card games work as cartridges. There was an export "card catcher" used in demo units, but it's obviously extremely rare as it wasn't a retail product. Anyway, a boot loader would have pretty limited use on an SMS 2 as there are no other slots to boot from, so I don't really see that as being an issue. It's a cool idea, and should be simple enough to do, you could just have a PCB with a rom at the back so it still fits in the slot. Street Fighter II on PC Engine does this. I guess you could increase the size through bank switching, but that would also increase complexity. Still, I wonder what practical use this would have over a cartridge slot boot loader and an expansion port gender adapter. I suppose that with a card slot boot loader you could permanantly have both domestic (if you also made a custom gender adapter) and export cartridge slots, without having to worry about switching adapters, but then you would still need to use a card catcher for card games. It's a cool idea, and should be simple enough to do, you could just have a PCB with a rom at the back so it still fits in the slot. Street Fighter II on PC Engine does this. What im planning to do is slightly more complicated. I hope to build the board with the flash physically embedded inside it. No idea if the flash will survive manufacturing yet but time will tell. Ive actually just finished a simple board layout with a rom on the back as mentioned above just to test it out before i go any further. I noticed something interesting there though. If you look at the pinout of the card slot, the pin ordering almost exactly matches that of a 27c256 (with a few extra pins here and there) from right to left, with the eprom upside down. That makes a lot of sense really as they probably took a standard rom die and just bonded it on the back of the board instead of bothering with a DIP package. That way they could use a standard chip and still keep esentially a single sided board. That was just the most potentially useful thing i could think using a card for. If you had the boot loader copy itself to RAM and run from there instead of straight from the card you should be able to remove it and still use the card slot for games. A bit of card swapping would go on each time you power up mind you. Bit of an edge case, but it would be very interesting for the Sega AI Computer, they are Sega My Cards pinout compatible except they contains up to 256 Kbyte of data, via extra address lines either via a mapper. There's 6-7 known units of the hardware at least in the wild but most software have only 1 or 2 known copies. Cartridge swaps tend to crash the system, card swaps probably will too. Bit of an edge case, but it would be very interesting for the Sega AI Computer, they are Sega My Cards pinout compatible except they contains up to 256 Kbyte of data, via extra address lines either via a mapper. Interesting... If any of the cards have been dumped then the card pin out may be known.. and we could make something from there. Im guessing its probably a very similar pin out to the SG-1000 cards just with a few extra address lines in place of other pins that are probably not needed rather than a mapper, but there could well be a mapper in there. Do you know how the addressable space is split up on that system? That may give us some clues. Finished off my first round of test cards today. This one was just something simple to confirm the pin out is right and check itll actually work using some chips i already had. Assuming it works (will find out when i get home in about an hour) ill do some more with the flash chips i intend to actually use and see if i can program them with and adapter and a card catcher. If that all works out then ill embed the flash inside the board and make some proper ones and see what happens. Well that worked. I tried Bocks boot loader and found a bug it in. When you load it from the card slot and bring up the slot selction window... the controller stops working. I guess its not likely to have been used in the card slot before, so never tested. That seems unlikely, can you try something else? I'd expect it to be more likely that the data is not good. No BIOS does a self checksum, but that is probably what you need here. Ok, Ive just tried the same chip on another board in the cart slot and that worked fine. Put the chip back in the card board and it worked fine too. Strange, must have dirty contacts on the card slot! Boot loader hasn't really been tested a lot so it's possible there's a bug in it. $A0000-$A3FFF, with two more selectable bank spaces at $A4000-A7FFF and $A8000-$ABFFF. These selectable banks are chosen by writing the bank number to $AFFFE-F.
Mappered games have open bus at $AC000-$AFFFF, and the $Bxxxx area is a mirror of $Axxxx. For example, Ocean Fantasy writes $80,$00,$01,$02 to $AFFFC-F. Most earlier AI MyCards have no mapper, and have a flat 128K ROM spanning $A0000-$BFFFF." So those last types must have 17 address bits (instead of 15 bits). The pinouts are compatible and we could dump 32 KB worth of AI card data using normal SMS card pinouts. I don't know which are the extra pinouts yet (asked Chris). If you think it is possible to create a flash card with mapper for Sega AI it'd useful. I was reading this thread and then I read on Bock's post about cards with mapper circuit. It got me wondering how that would work? Because the card slot has no A15 signal. I could not find a explanation on the developer section what the /EXM1 and /EXM2 signals do so if the card has to put stuff out at any addresses past 0x7FFF there must be a mechanism for the card to figure out the state of the CPU A15 line. I was wondering if /EXM1 and /EXM2 are used for the purpose of selecting memory regions past 0x8000. If you inverted the /M8-B signal then that would essentially be the same as A15 right? In which case a standard mapper would probably work fine. Assuming thats what they have done... then for the AI cards you only need A16... which would be in place of /CONT? Hey it just occurred to me that the SEGA Scope 3D interface put the registers at 0xFFF8. So having a look at how the 3D glasses interface works should give me my answer. /EXM1 and /EXM2 will be /M0-7 and /M8-B. /M0-7 is low in the range of $0000 - $7FFFF and /M8-B is low in the range of $8000 - $BFFF. The 3D glasses adapter doesn't actually use /M8-B though. The memory location the game writes to is $FFF8 but as its not got A15 on the connector the adapter actually sees a memory write at $7FF8 and assumes its correct. That's actually the side effect of having address lines disconnected, aka "mirroring". If the card with mapper sticks to a 32KB window, we don't need to worry about mirroring being detrimental. Ive done a flash version to test. I quickly threw a chip down before i left work tonight (its got a couple of solder shorts that still need cleaning up though). I don't have a card catcher yet (got one on its way off ebay) so im sadly not really able to do much with it till that arrives. I had another interesting idea last night, which is a card to cart adapter (card catcher in reverse). Ive not seen anything about doing this so ive done a quick board to try it out. The pinout between the two was almost identical so it was essentially a straight through adapter like the expansion port. Should have that finished off tomorrow so ill post some pictures when i get home. The cards with mappers mentioned by Bock are for the Sega AI Computer, which has a slightly different pinout on the card slot. However, at one point Sega did plan to release cards with mappers for the Master System - the official SMS documentation describes 128KB cards as "in the works". It got me wondering how that would work? Because the card slot has no A15 signal. [...] I was wondering if /EXM1 and /EXM2 are used for the purpose of selecting memory regions past 0x8000. The /M0-7 signal can be used in place of A15. In fact, some single-chip cartridges (those which use a 171-5519 / 171-5519D board) connect /M0-7 to the chip where other cartridges (171-5507 / 171-5507D) connect A15. Another question... Since official schematicsfor SEGA hardware are now public domain and it's extremely unlikely that SEGA or anyone else will complain about trade secrets, how about we stick to official hardware signal names? That would sure help preventing confusion. I see enough free space in your proto card, for a 3.3v regulator also, in smd form. It is possible because the chip select lines are equivalent to A15 and /A15. I hope the best to the new baby member of your family. Are you the author of a software suite for program and dump flash cartridges, or I am wrong? Via a PC parallel port? Yes, I wrote a Windows program for the SMS Reader. It's probably fairly dreadful by current standards and has problems with modern versions of Windows. I had a crazy thought to make a complete SMS flash cartridge, based on "viletim" work here, with the parallel programmer (from another member here) on board. But without a Suite to work at least on WinXP, and support today's USB to parallel programmer cables, this does not make sense. I know cause today multi cartridges like EverDrive, do these to show a waste of time. But I like to design and make PCB's, and then complete the construction to a working device. Modern technology means we don't need any of that, there are modern flash cartridges in development (which could have card versions too) which are programmed at relatively high speed over USB in a way that works in modern operating systems. Based on this, it is understood cause someone in our days not need nothing more than an EverDrive cartridge. 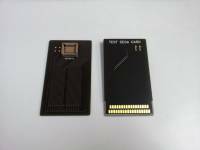 Therefore why is all this talk around a new implementation of "my cards" type cartridge? I only looked at this because no one else seems to have and its something fun to play round with. I havnt really had time over the last couple of weeks to go any further with this though. Id be interested to look at the cpld based mapper you have got working. To be honest I haven't test it till now. Just applied the original design on a well known to me CPLD. Before some days I see your thread here, and I asked why not go further. If you finally extend your board with this, I am interested to buy one (even net PCB only) as to test it and make any corrections it may need. Also I could help on pcb design if asked. I will post later the *jed file for this CPLD. Above attached the *jed file to program the CPLD. If you open it with a text editor, you will see the matches of pin's which placed randomly. From what I have read on another thread, someone else make it on its original Altera form, and it work! So I don't see a reason why not work on Lattice? I needed some card games for testing and figured id never be able to buy them all so got back on to this. Ive designed a small programming adapter. Should have the boards back today for that, so will post some pictures later once thats assembled. Ive designed a small thin board with flash on it in roughly the same manner as a 'my card' had. I made a cardboard mock up of a card to hold it in place and check it in a console and it worked fine as expected. Its a 128k flash rom but ive only got 32k of that exposed to the console. I might do some others with 48k exposed but more than that will require a mapper. Ive also found some plastic sheet that ill machine to make the cards from. Its close on the thickness side of things but should work out ok. The circuit board is 0.3mm thick and the flash chip is ~1.15mm thick once soldered down, making the whole thing ~1.45mm over all. As the card is 2mm thick theres ~0.55mm left by the time you route a pocket into it for the flash chip to sit into. Once the board is glued in i think itll be fine. Put my programming adapter together tonight, checked it, and works as expected. So now i just need to machine the plastic and ill have a bunch of flash my cards. Have tested in a master system, card catcher and power base converter on a mega drive and it works in all 3 situations. On a side note, ive noticed an oddity in the pin out on the card catcher. /Memreq on the card socket is connected to /CSRAM on the SC-1000 connector. Don't quite understand why they have done that. A normal card has that pin disconnected internally (as i discovered with the Xray) so it doesn't have any effect on a card game. It would also break any compatibility with the 3d glasses adapter, but i guess youd never use that in a card catcher anyway and the card catcher predates the 3d glasses adapter.